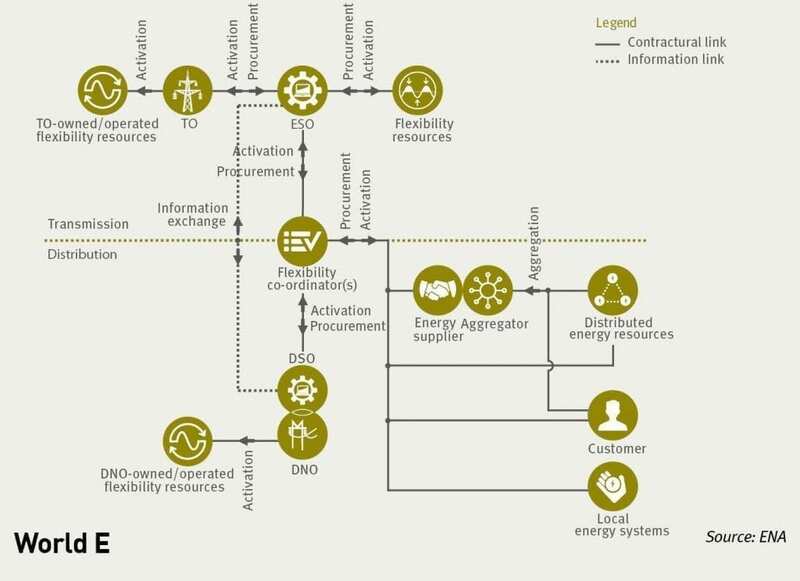 The ENA has published its future ‘world’ scenarios to feed in to government thinking on how best to transform network companies into distribution system operators. Tom Grimwood reports. The shift to a distribution system operator (DSO) model for distribution network operators (DNOs) has been in the works for a number of years. DNOs have been busy developing, trialling and sometimes even rolling out a raft of new technologies, systems and markets that will be required for this radical transformation. 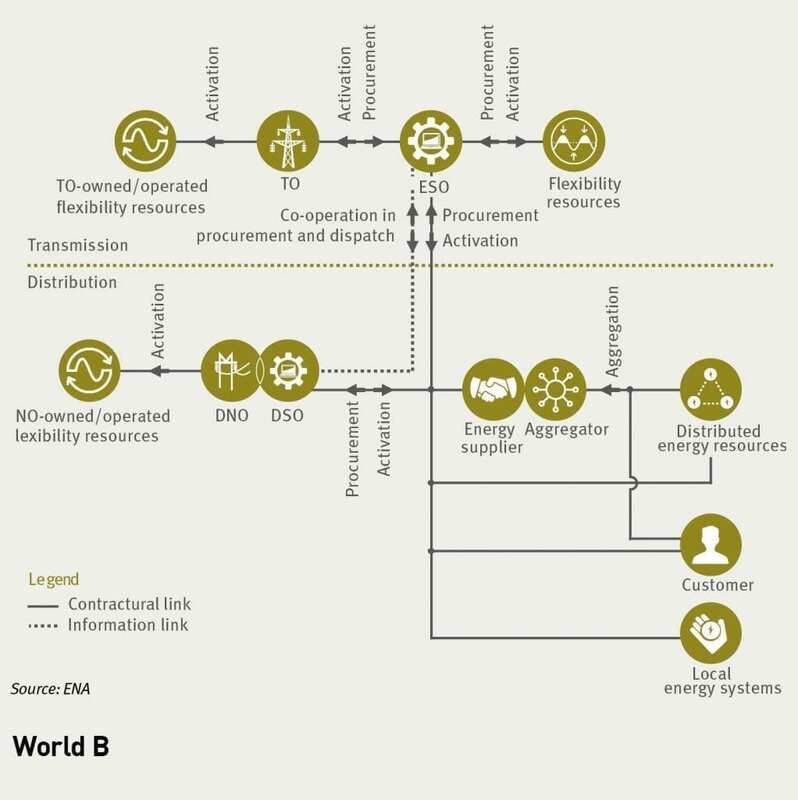 The transition will see DNOs move from a passive “fit and forget” approach to the management of their networks to a more active role in which new sources of local flexibility – distributed generation, demand-side response and storage – are deployed to deal with congestion and constraints. In doing so, they hope to save billions of pounds for consumers by delaying, or avoiding entirely, the expensive upgrades that would otherwise be necessary to accommodate a growing volume of intermittent renewables on the power grid. A government-commissioned report by Imperial College London concluded that a smarter, more flexible power grid could reduce whole-system costs by between £17 billion and £40 billion by 2050. But there are multiple ways in which this model could be achieved. As yet, there is no plan for the overall structure of the electricity system and the relationships between its participants. How will the constituent parts be fitted together to form a coherent whole? 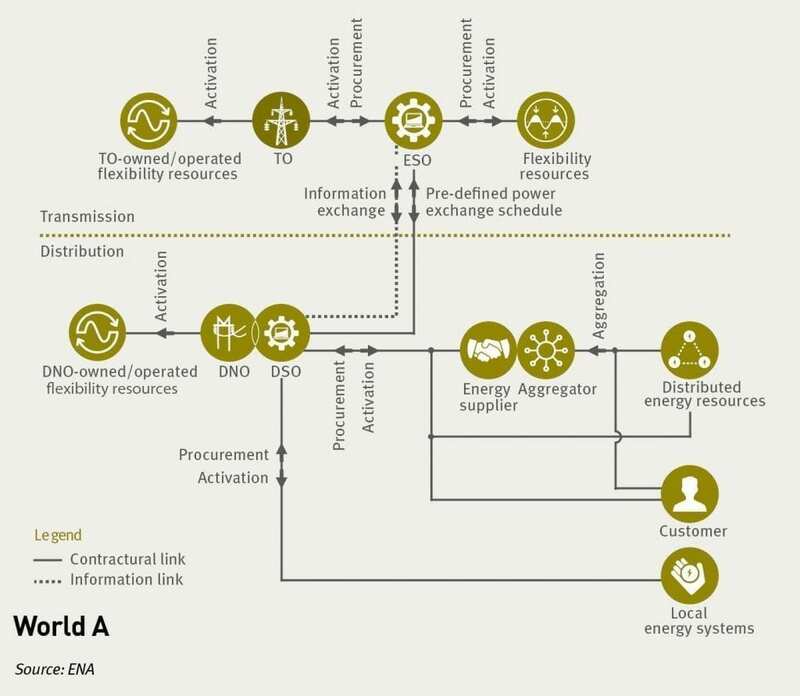 Over the summer, the Energy Networks Association (ENA) published its Future Worlds consultation as part of its efforts to come up with a blueprint, outlining five possible options for stakeholders. The consultation is part of the ENA’s Open Networks project chaired by Western Power Distribution network strategy and innovation manager Nigel Turvey. “It’s really trying to look forward in terms of the potential ways markets could be organised to allow access to all of the network companies to the flexibility that is out there,” he explains. The consultation closed to responses on 25 September. Turvey says its findings will underpin an impact assessment of the different options, which will be passed on to Ofgem and the Department for Business, Energy and Industrial Strategy (BEIS). “In terms of the impact assessment, the internal report is due by the end of the year – by Christmas basically,” says ENA head of innovation and development Randolph Brazier. “We’ll probably do a consultation in Q1 next year and then we’ll hand it over to Ofgem and essentially provide them with an evidence base that they can use to make a choice, or give us some direction on what the future will look like. Brazier says the impact assessment will focus on the relative differences between the models rather than attempting to make any firm predictions about what the future energy system will look like in each instance. “We know there’s some underlying uncertainty that’s very difficult to cater for,” he adds. “By making sure we compare between the models, we can determine which one works best in this uncertain future. One of these uncertainties is over the future of network charging arrangements. Ofgem is currently conducting two significant code reviews – one looking at the residual charges designed to recoup the sunk costs of the existing infrastructure and another examining connection arrangements and the forward-looking charges intended to pay for upgrades. Brazier says the regulator’s plans for network charging will be built into the models once they are known. He believes they should have an idea of the direction of travel before the impact assessments are completed. And Turvey says there will be no halt in progress while they wait for a decision on which world to pursue: “What we are looking at across these worlds is what aspects and activities are common; what sort of things are needed no matter which world is delivered. DSOs procure and dispatch flexibility services from distributed energy resources to deal with their own local constraints. They also act as non-commercial aggregators for their licence areas, selling services on to neighbouring DSOs and the electricity system operator (ESO) at National Grid to meet regional and national requirements. This includes providing balancing and ancillary services to the ESO. From the ESO’s perspective, DSOs behave similarly to any other party connected to the transmission network. The aggregated services they offer are considered on an equal footing to those from flexibility providers connected at the transmission level. DSOs become balance-responsible parties and establish their own settlement systems to confirm that requested services have been delivered. DSOs also manage flows to and from the transmission network based on a schedule agreed with the ESO in advance and make connection offers to new customers based on these limits. The ESO and DSOs work together to procure and dispatch flexibility services to manage their respective constraints. There is a national market for flexibility providers connected at the transmission and distribution level that is similar in nature to the current balancing market. DSOs may also host additional regional and local markets for distributed energy resources. Where new connections at the distribution level cause issues across the boundary with the transmission network, DSOs submit a “transmission impact assessment” to the ESO to ensure the co-ordinated development of networks. World C is the same as world B in most aspects. The key difference is that the reforms to network charging and connection arrangements currently being considered by Ofgem provide strong cost-reflective price signals to market participants. They are more consistent across transmission and distribution but also vary depending on time and location. Customers make more efficient investment decisions and the need for ESO and DSO intervention to manage constraints is reduced. The ESO is responsible for the procurement and dispatch of all flexibility services, or perhaps down to a minimum size threshold. DSOs submit their requirements to the ESO, which then presents these needs to service providers alongside its own and decides on the best course of action. The ESO is also responsible for settlement. 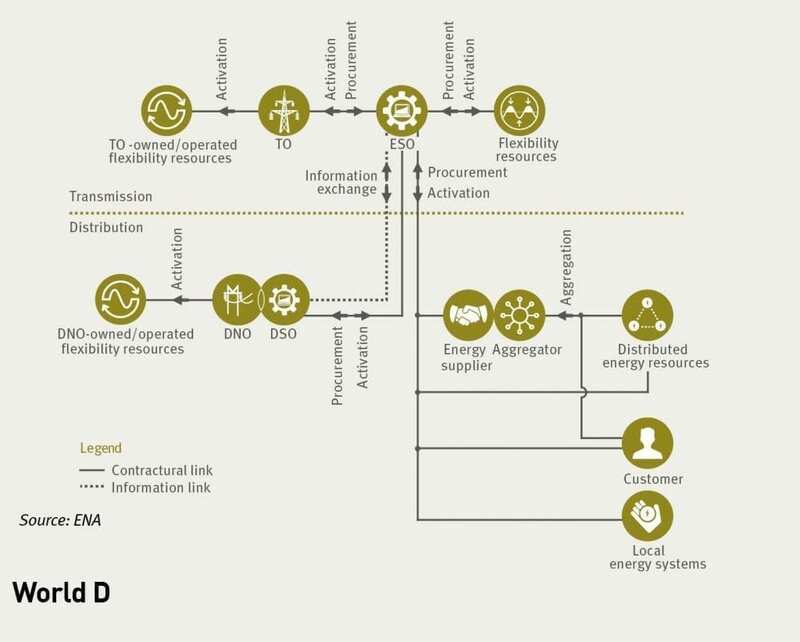 Connection arrangements at the distribution level could take the form of tripartite agreements between customers, DSOs and the ESO. Alternatively, they could be similar to the current arrangements for customers connecting at the transmission level, with the ESO being the first point of contact and also holding the agreement. A new type of party called a flexibility co-ordinator acts as an independent, neutral facilitator for all local flexibility markets. There could be single national body or a number of standardised regional entities. The flexibility co-ordinator procures and dispatches distributed energy resources on behalf of the ESO and DSOs. It is also responsible for the settlement process and recovering its own operational costs. The flexibility co-ordinator uses a common platform to collect offers from flexibility providers and select the best bundle based on requirements submitted by the ESO and DSOs. It is up to the flexibility co-ordinator to manage any conflicts that arise, although the ESO retains overall responsibility for the procurement of national and regional services.